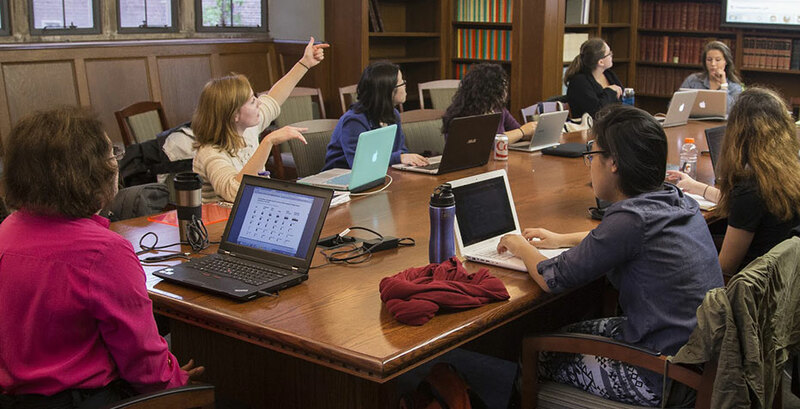 Each month during the academic year we profile one course and the professor who teaches it, to give a sense of the breadth of offerings at Wellesley and the passion of those who teach here. What better course to consider during a heated election season like Fall 2014 than one that closely follows, critiques, and reflects upon some of the tightest races in the nation. Professor of Political Science Marion Just is teaching that very course, a new Calderwood Seminar on Public Writing, POL1 319 Campaigns and Elections. Through their reading, discussing, and especially iterative writing, students investigate why campaigns are important and what elections mean for democratic governance in the United States. This course is a natural fit for Wellesley, where engagement and even activism all across the political spectrum is a yearlong—even lifelong—endeavor, just perhaps most visible in the run-up to an election. The understanding students get from Just's course help them bridge the gap between comprehending complex and arcane aspects of politics and communicating those subtleties to those who may not be making as intense a study of it. Throughout the seminar students have applied various journalism styles including reporting about campaign events, candidates, and relevant political science research; blogging; and commentary. They've dived into mutually supportive criticism and shared their individual projects on competitive Congressional races.